Canterbury. Official seat of the Church of England. A cathedral city and UNESCO World Heritage Site. Inspiration for Geoffrey Chaucer’s literary classic The Canterbury Tales. An important destination for religious pilgrims visiting the shrine of murdered twelfth century archbishop Thomas Becket. A city full to the brim with history, culture, art, literature, impressive architecture, and much much more. Canterbury is conveniently located just over 50 miles to the south east of London. With easy access to mainland Europe via nearby Dover and stunning local scenery both on the coast and the countryside, Canterbury is a much sought after destination for homeowners and visitors alike. But do you know what county Canterbury is in? If not, you wouldn’t be alone. If you live in or around Canterbury, you might be surprised to hear that many people living in the UK don’t know which county is home to Canterbury. When asked the question: ‘What county is Canterbury in?’, the reply may be a non-committal shrug or perhaps, ‘I think it’s one of the Home Counties’. For a city so deeply embedded in our country’s history, you’d be forgiven for thinking that everyone’s answer to the question must surely be KENT, KENT, KENT. Canterbury is of course located in Kent. The general public’s ignorance of this fact can perhaps be blamed on the state of the education system in the nation’s schools or a general disinterest in UK geography. For many people, however, Canterbury, and Kent are important and integral places in the UK’s rich and varied history. Kent is quintessentially an English county. Often referred to as the Garden of England, Kent is home to a plethora of orchards and hop gardens. 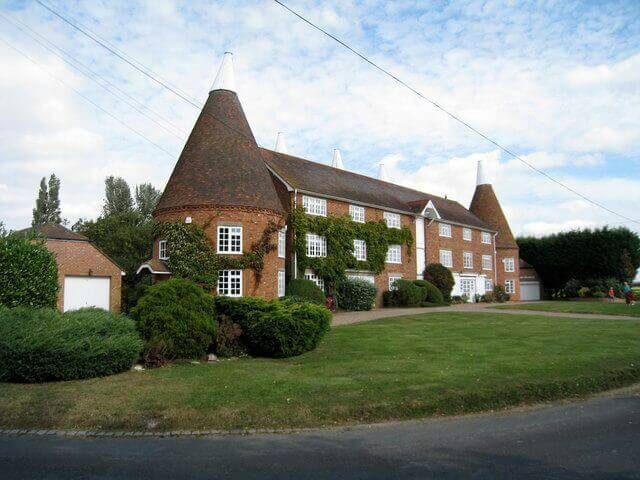 The distinctive Kentish Oast houses, traditionally used for drying hops to produce ale, have, in many cases, been converted into impressive residential properties. Kent remains the UK’s largest producer of hazelnuts and for many is the epitome of traditional England. The county of Kent has ancient origins. The area now known as Kent has been occupied since prehistoric times. There is much evidence of Bronze Age, Iron Age and Roman era occupation across the county. 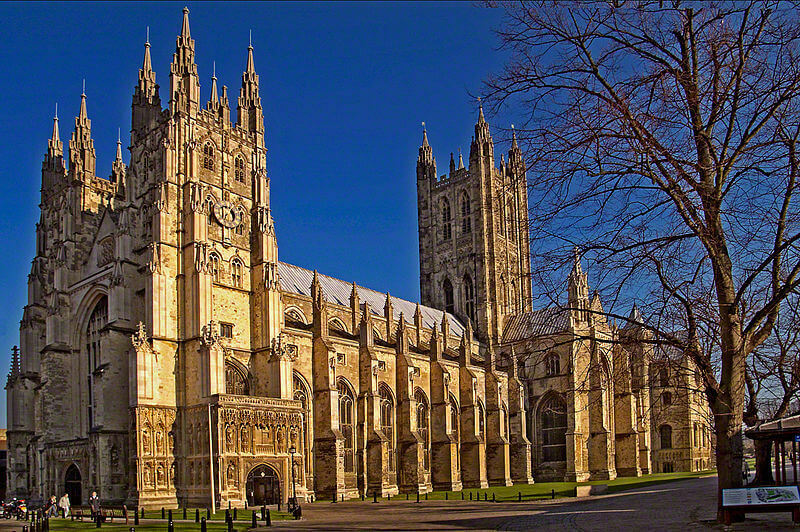 In the early Medieval period the people of Kent regarded Canterbury as their capital and its importance as a centre of religious thought and administrative power has grown ever since. 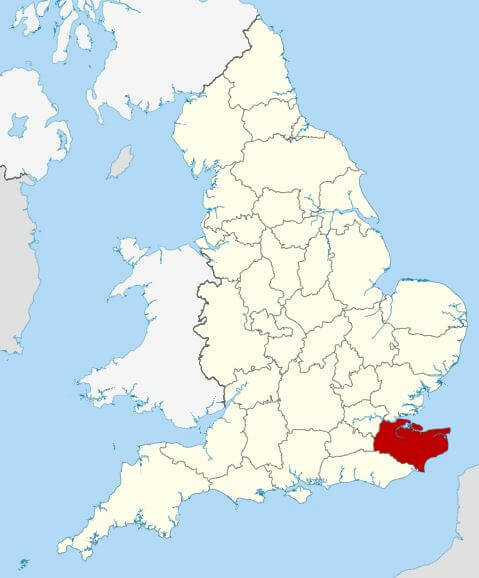 The name Kent is thought to derive from the Celtic word Cent meaning coastal district or corner land. The alternative spelling of Cant, or the Latin name Cantia is probably where the name Canterbury was derived. Kent’s location on England’s south eastern most point has been instrumental in many conflicts. As early as the 11th century, the inhabitants of Kent were proud of their resistance to foreign assault. After repelling the Norman invasion, the people of Kent took on the motto Invicta, meaning the unconquered and Kent was a semi-autonomous county for several years. Throughout the 17th and 18th centuries, the River Medway was used by the Royal Navy to once again protect British shores from invasion. Forts were built along the coast and much ship building was carried out in Chatham Dockyard, on the banks of the Medway. During the Second World War, the skies above Kent became the location for large parts of the Battle of Britain, as British aircraft fought off attacks focused on nearby London. When you visit Canterbury today, you’ll soon appreciate its important historical significance. Everywhere you look, the city is steeped in history, and the people are eager to share their own experiences of life in England’s foremost cathedral city. Canterbury’s skyline is dominated by its architecturally impressive cathedral. One of the earliest Christian buildings in England, Canterbury cathedral has an international reputation for its religious importance and historical significance. Its Gothic style spires, decorative font, and beautiful stained glass windows draw visitors from around the world. Away from the cathedral the narrow and winding streets have a unique atmosphere from a different era. The city centre is still partially surrounded by the original walls built by the Normans as defence against invaders. Sitting on the banks of the River Great Stour, Canterbury is a snap shot of an older Britain. The cobbled streets and timber-framed buildings are the perfect backdrop to a meal or a drink at one of the many restaurants, pubs, and cafés. At FineLine Windows, we enjoy an enviable location in the heart of Kent. Our two stylish showrooms are conveniently located in Maidstone and Dartford respectively. Our installation teams work across the county and have worked on many properties in Canterbury itself. If you live in Kent and you’re planning any home improvements come along to one of our showrooms or contact FineLine on 01473 467 181 or send us a message online. One of our friendly advisors will be happy to offer you advice on the best solutions for your home improvement plans. When you want to make the most out of your Canterbury home, choose FineLine Windows.